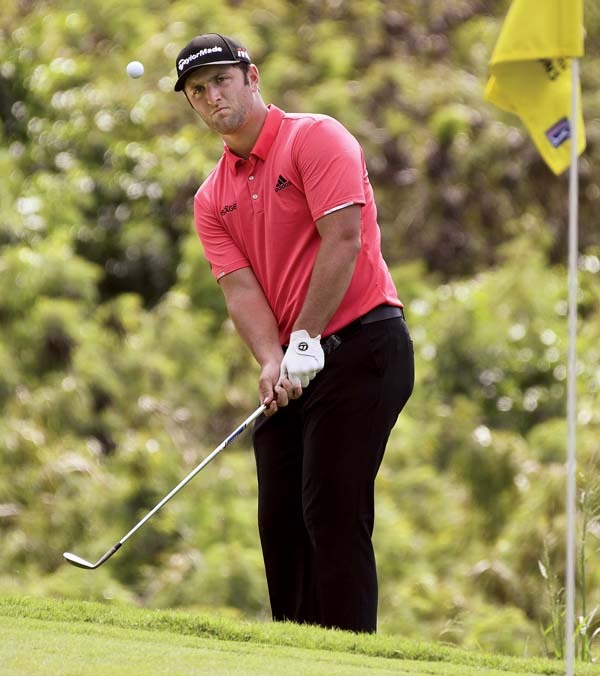 KAPALUA — Thursday was a lonely round of golf for Gary Woodland. 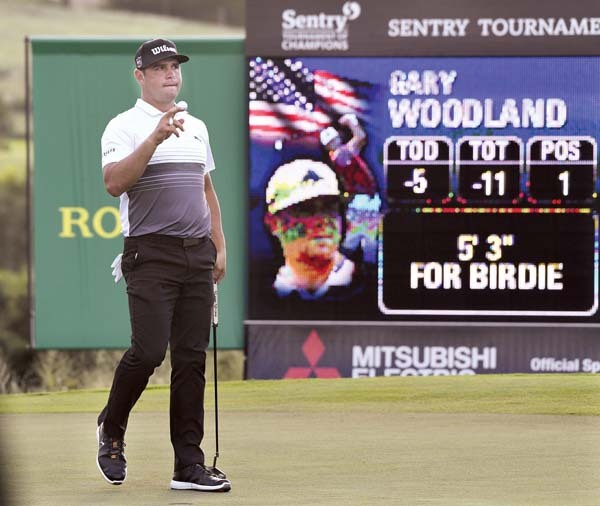 By the end of Friday’s second round of the Sentry Tournament of Champions, he stood alone at the top of an impressive leaderboard. 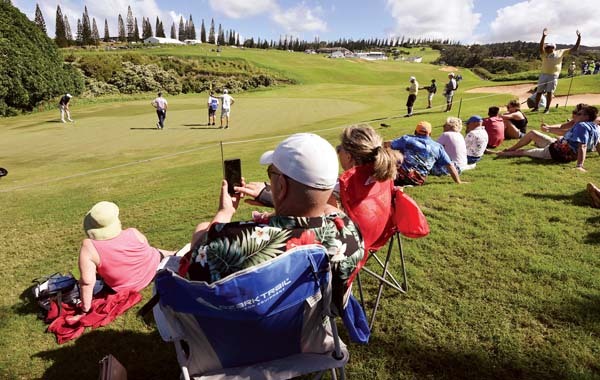 A day after traversing the Kapalua Plantation Course alone when playing partner Kevin Na withdrew, Woodland played in the final group and carded a second straight 6-under 67 — including a 31 on the back nine — to get to 12-under 134, which was good for a three-shot lead going into the weekend. Rory McIlroy and Bryson DeChambeau each shot 68 and were tied with first-round leader Kevin Tway (71) for second at 9 under. Woodland, who is ranked No. 31 in the world, and DeChambeau will be in today’s final pairing, teeing off at 10:45 a.m. Woodland said his aggressive mindset will not change. Woodland and Tway pushed themselves down the stretch. Woodland had five straight birdies from Nos. 11-15 to vault out of the pack before adding an easy birdie on the 18th. In his two previous appearances here, Woodland finished 24th in 2012 and tied for 13th in 2014. Tway recorded three straight birdies on holes 13-15, but lost his streak of 34 straight bogey-free holes with a blemish on the 17th. McIlroy, the eighth-ranked player in the world, is clearly becoming more and more comfortable in his first appearance here. 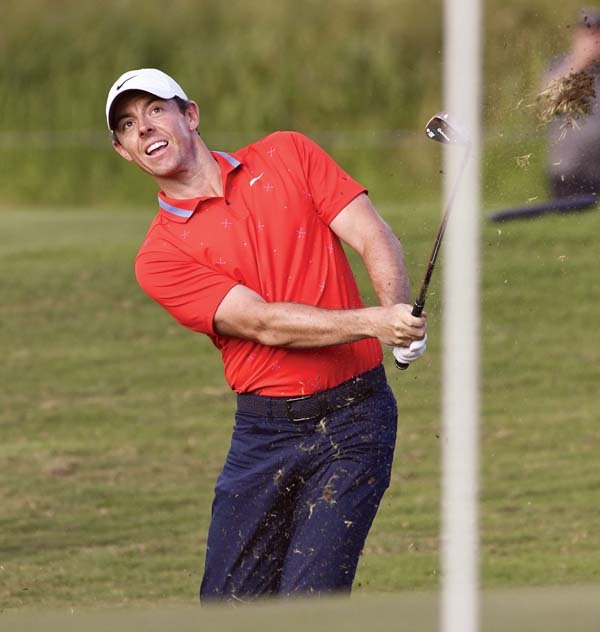 All factors appear to be coming into focus for McIlroy. DeChambeau had impressive par saves on Nos. 10, 11 and 14 and leads this field in strokes gained putting. Marc Leishman is fifth at 8 under after he shot 5-under 32 on the back nine, the second-best score of the day on the last half of the course, behind Woodland. 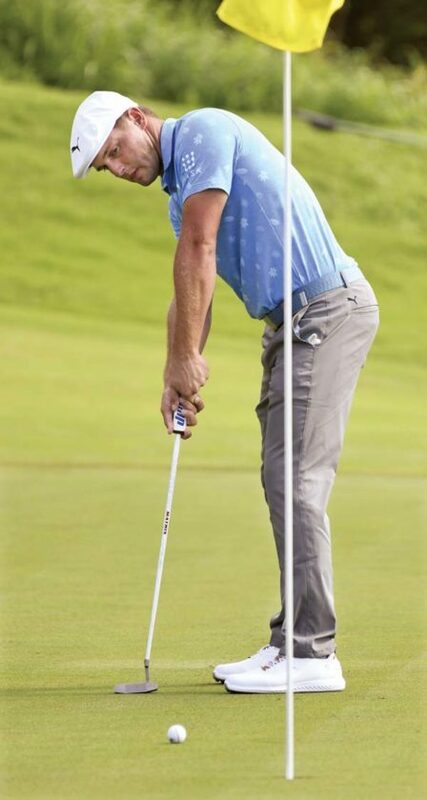 He triple-bogeyed the sixth hole on his way to 2-over 38 on the front. 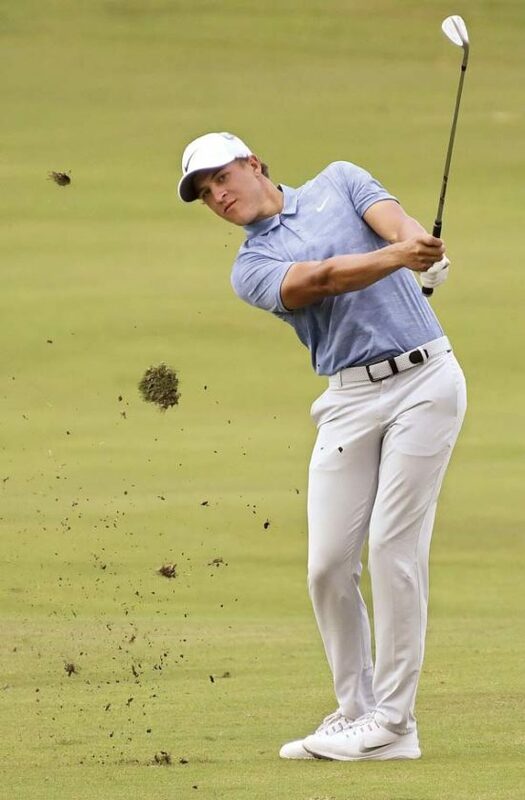 Xander Schauffele (67), Cameron Champ (68) and Justin Thomas (72) are tied for sixth at 7-under 139. Schauffele carded six birdies and no bogeys. His second shot on the 663-yard 18th from 314 yards away landed 11 feet from the pin — he two-putted for birdie. “I didn’t feel like doing the math on the scorecard, we had 255, 257 adjusted front, so it was just a 5-wood and I made good contact and started it somewhere in the bleachers and let the wind do its thing,” Schauffele said. Champ, the tour leader in driving distance, was pleased after opening with a 71. 8:15 a.m.–Ted Potter Jr., Bubba Watson. 8:25 a.m.–Billy Horschel, Scott Piercy. 8:35 a.m.–Keegan Bradley, Brooks Koepka. 8:45 a.m.–Matt Kuchar, Patrick Reed. 8:55 a.m.–Aaron Wise, Brice Garnett. 9:05 a.m.–Troy Merritt, Andrew Landry. 9:15 a.m.–Charles Howell III, Paul Casey. 9:25 a.m.–Brandt Snedeker, Francesco Molinari. 9:35 a.m.–Andrew Putnam, Michael Kim. 9:45 a.m.–Dustin Johnson, Webb Simpson. 9:55 a.m.–Patton Kizzire, Jon Rahm. 10:05 a.m.–Ian Poulter, Jason Day. 10:15 a.m.–Cameron Champ, Justin Thomas. 10:25 a.m.–Marc Leishman, Xander Schauffele. 10:35 a.m.–Rory McIlroy, Kevin Tway. 10:45 a.m.–Gary Woodland, Bryson DeChambeau. HOLDE OF THE DAY: No. 8 / 203 yards • Par 3 / The eighth hole played as the toughest Friday with four birdies, 20 pars, six bogeys, two double bogeys and a triple bogey to play 0.273 strokes over par. 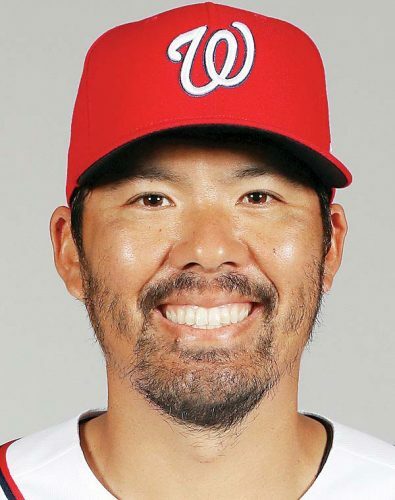 For the tournament, No. 8 has seen an ace by Patton Kizzire on Thursday, nine birdies, 40 pars, 12 bogeys, four double bogeys and one triple bogey.